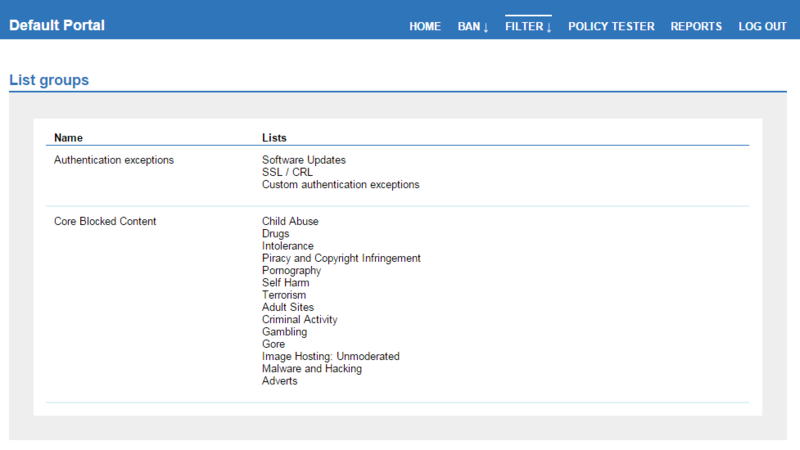 A filter list group is a collection of categories, made up of URLs, domains, phrases, lists of file types, security rules, or any combination of these. Guardian uses these groups in web filter policies to determine if a user should be allowed access to the content they have requested using their web browser. You can edit which categories belong to existing category groups. Note: Creating new, or deleting existing groups cannot be carried out from the User Portal. You must have access to the Smoothwall administration user interface for those tasks. 2. Go to FILTER > LIST GROUPS. 3. Locate the relevant group Name, and click one of its entries. a. To add a new category to the group, select the relevant category. b. To delete a category from the group, clear the relevant selection. Note: For Multi-Tenant licensed systems, only those category groups owned by the logged in tenant are shown. Global category groups, including those owned by the central administrator, are not available for editing.